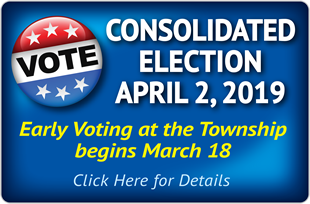 West Deerfield Township will again serve as an early voting site during this Fall’s election. Early Voting takes place 15 days before Election Day, and will run Monday, October 22 through Saturday, November 3; Monday through Friday, 9 a.m. – 5 p.m., and Saturdays 9 a.m. – 2 p.m. Early voting at this location is not available on Sundays. Any resident of Lake County is welcome to early vote at this site. Remember, you must vote on Election Day, November 6, 2018, at your designated polling place. Polls will be open on Election Day from 6 a.m. – 7 p.m. You may find your Election Day site at LakeVoterPower.info, or by calling the Township at 847-945-0614. Not registered to vote? You may do so at any Early Voting location. Voter registration is also available at your assigned Election Day voting site serving your current address. Please contact Township Clerk Kristen Scott with any questions you may have: 847-945-0614. West Deerfield Township is hosting a Halloween Party for children with special needs.